Porsche is really going all out celebrating the 50th anniversary of the 917. The company released the modern concept car, has an exhibit in Stuttgart, and now has showcased several versions of the car at the 77th Goodwood Members Meeting. The company wanted to celebrate the 917’s prowess as a racecar, and showcase all of its victories of the 24 Hours of Le Mans, of which, the company has 19. The showing at the 77th Goodwood Members Meeting showcased the original 917 as well as four other versions. At the Member’s Meeting, it was driven by none other than Richard Atwood who piloted the 917 to a victory at Le Mans, which was Porsches’ first. That victory started Porsche’s strong performances at the race. It also helped save the company from obscurity and bankruptcy at the time. 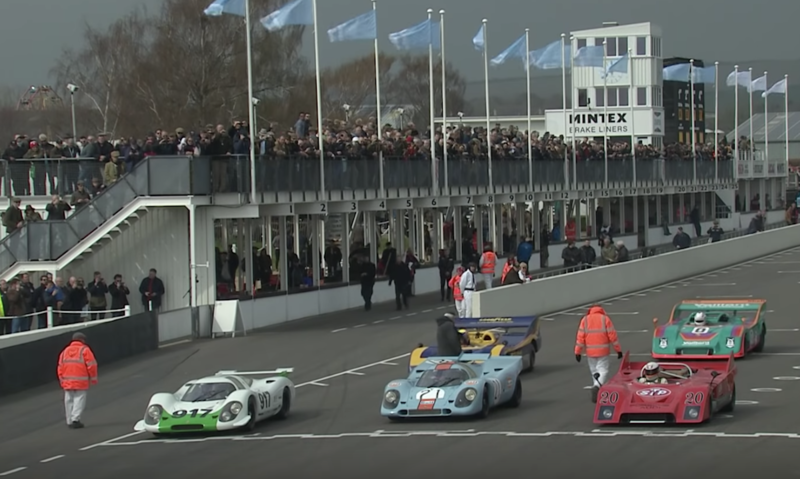 The video below shows some of the action at the Goodwood Meeting. That car’s more or less cruise around. It’s nice to see them out on the track moving. There are so many good shots of these iconic cars. It makes you imagine just what they must have been like in their time. Porsche at the moment has no plans to create a production car out of the modern 917 concept mentioned above, but we sure wish the company would.